Le Jardin du Luxembourg is a beautiful place to spend a lazy summer day in Paris. The history of Luxembourg Palace dates all the way back to the 1600’s when the widow of King Henry IV had it constructed as one of her royal residences. These days it serves as a meeting place for the French Senate. The lush gardens that surround the palace have become a popular lounging spot for locals and tourists alike. The gardens are meticulously maintained by city staff and the range of exotic plants and trees that can be found on the grounds are quite the sight to be seen! We spent many afternoons here lounging in those famous green chairs, enjoying treats from the market and sipping on miniature bottles of wine. If it sounds like heaven, believe me, it absolutely was! About halfway through the summer, I realized that we hadn’t taken any photos of the location. I put on this floral dress and we got to work capturing the beauty that is Le Jardin du Luxembourg. For the edit, I used the “Glowing” Lightroom Preset from The Portrait Collection. Check out the before and after photo below! 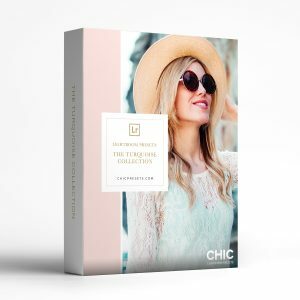 The collection that I used today is also available alongside 12 others in The Complete Collection, which features 530+ beautiful Chic Lightroom Presets and Brushes for you to discover! Enjoy all of the Parisian beauty below and don’t forget to check out the shop for more before and after examples! This entry was posted in Chic Lightroom Presets. Bookmark the permalink.